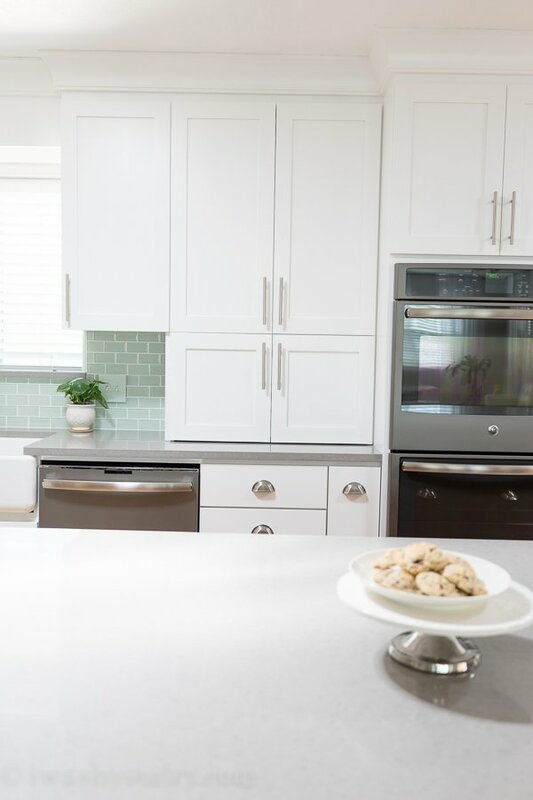 Two weeks ago when I shared my Kitchen Reveal with you, several of you were impressed by some of the little tricks, or “hacks” that I’ve done to really customize my kitchen to what works for me. 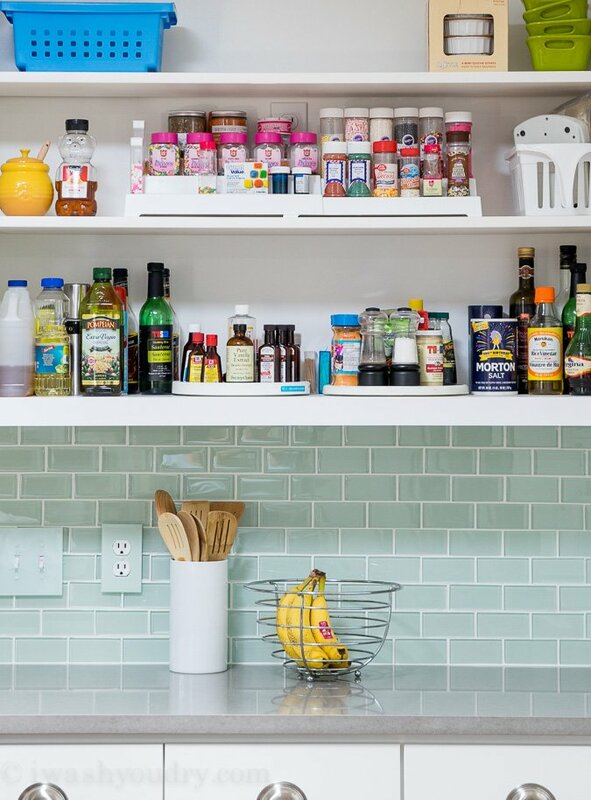 Today I’m going to let you in a little closer, sneak a peek behind my cabinets and drawers and show you 13 of my favorite Kitchen Hacks to Organize and Make Your Kitchen Flow Better! We’ve all been there, frustrated by a kitchen that just doesn’t flow properly. When I was designing my kitchen, there were several issues for organization that I wanted to address to make sure everything had a place. 1. 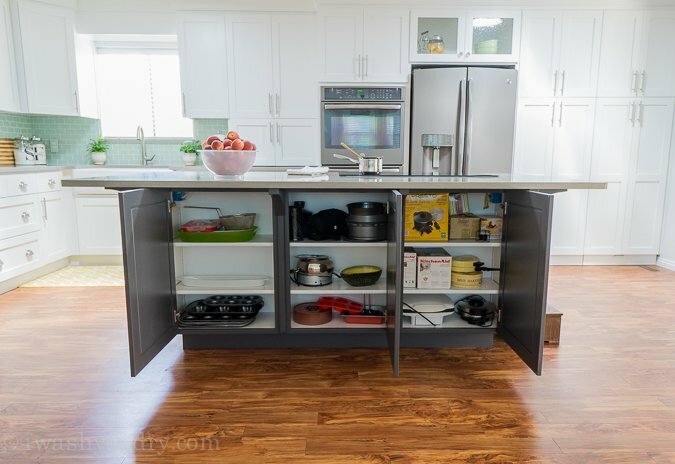 Hidden Cabinets in Island for extra storage! Our island also doubles as a breakfast bar for our 4 kids. But behind those four yellow stools hides some secret storage! So why is it so secret? Well, when we refinished the original island we changed out the door fronts and left off the cabinet door pull hardware. This gave it a more finished and furniture look. I just love the clean lines! Now I can stash all the random kitchen items that I don’t use on a daily basis, like platters, tortilla warmers, French omelette makers (it was an impulse buy) and my Kitchen-Aid attachments! These were a fun addition! Another opportunity to maximize the space we have for additional storage! Now I have the perfect spot for things like my muffin tins, linens, and more serving platters! 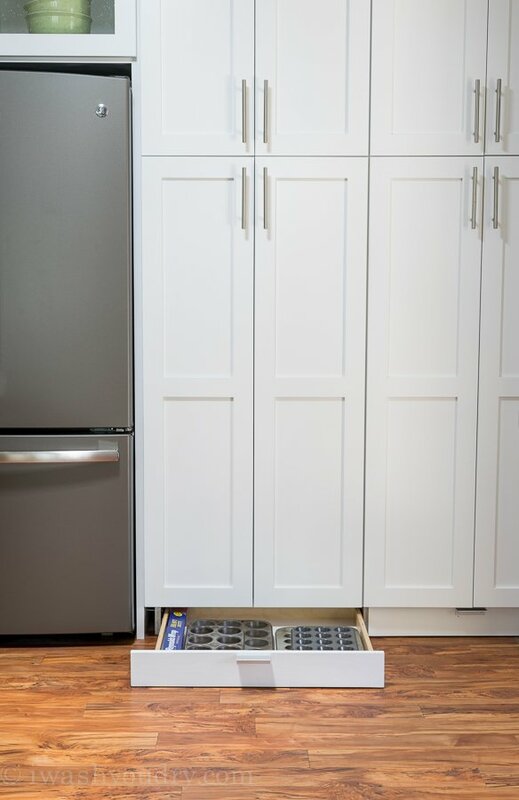 We used a very thin handle screwed to the top of the drawers, so when they are closed you can hardly see them hiding underneath our pantry! Due to the way we designed our kitchen, the pantry shelves were extra deep (counter depth at 24 inches), so the whole wall was one even depth. This would make getting into our pantry sort of annoying, and almost guarantee something getting lost way back there. 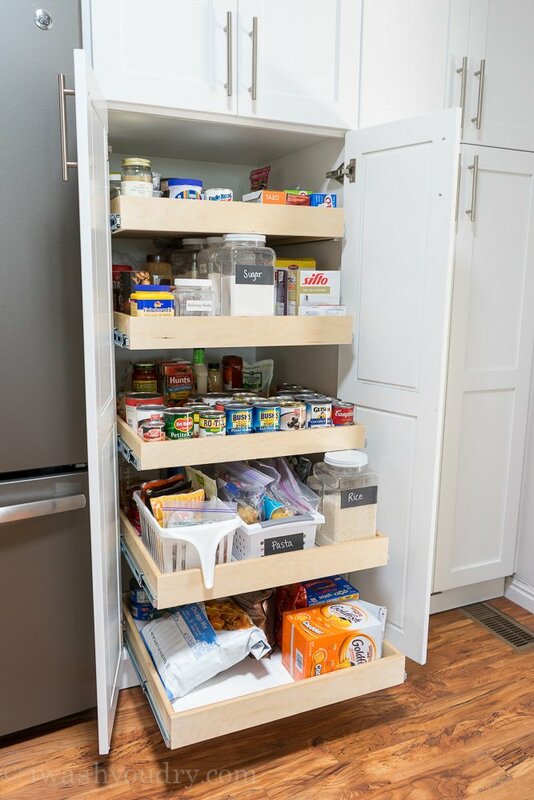 We decided to install these super convenient roll out pantry shelves, which makes my pantry a breeze to get into! The guides that roll the shelves in and out are extra sturdy and can hold well over 100 pounds, which means… load up those cans! I’ve organized each shelf to hold specific items, so everything stays organized and right where I need it. You should definitely invest in something like this! We have two pantry cabinets next to each other, and I didn’t put the roll out drawers in both, so to keep this one organized and make sure I can reach everything in the back I’ve used baskets! 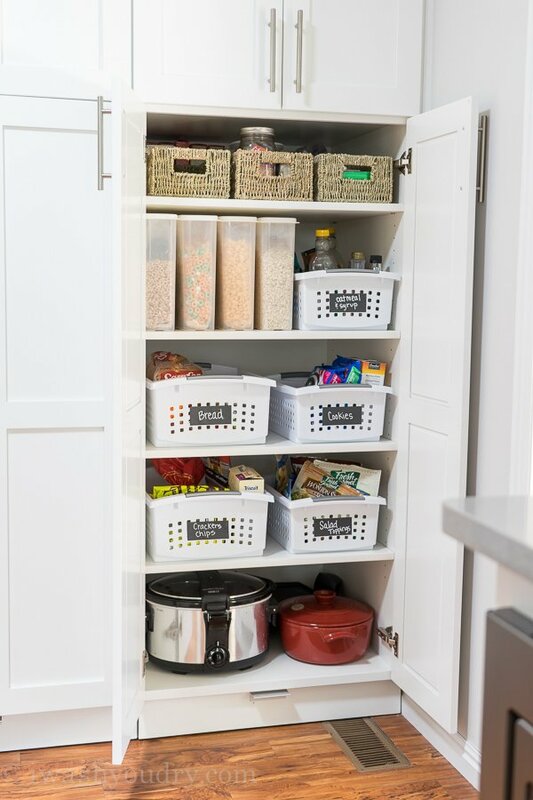 I didn’t want to spend a fortune on baskets, but I still wanted to be able to write on them, so my kids wouldn’t mess up my pantry! I found these baskets on Amazon and found some chalkboard labels, which lets me write on each basket, but also able to change it when I need to. Also – Cereal tupperware is a must. My husband thinks these are ridiculous, but I stand by them. They keep the cereal fresher longer, and I can easily see when we need to get more. I found mine at Walmart and Amazon! … and pretty much anything else that is long, skinny, and awkward to store. This was one of those things that was a MUST for me. In my previous house I used one of those metal file organizers to keep my boards organized and it was heavenly. 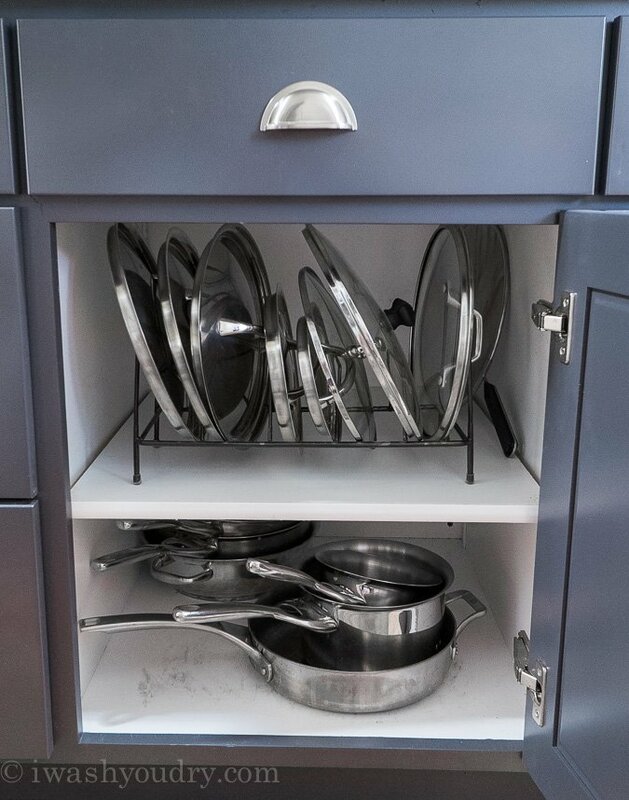 I used the cabinet above my oven to strategically store everything in a vertical manner with these awesome separators, and it’s seriously a life changer. This simple wire addition was only about $30 and worth every penny. 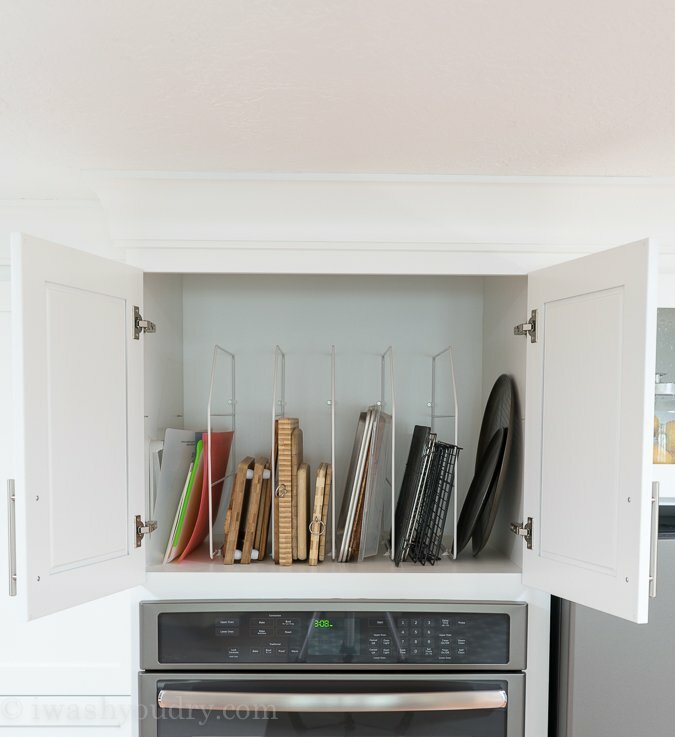 There was just enough room under the double wall ovens to sneak a little drawer in, which is perfect for those roasting pans and extra baking pans! Since we moved our stove top to the island, I wanted my spices to be as close to me as possible. 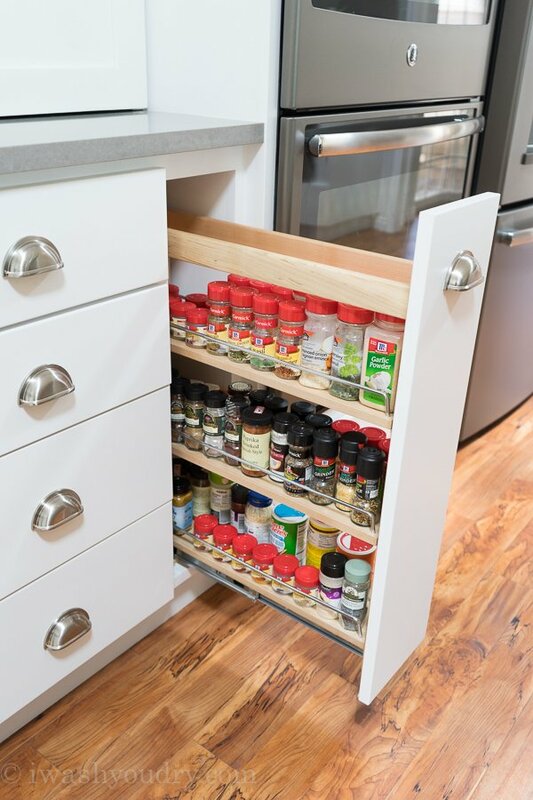 I was able to squeeze in a small spice drawer pull out between my oven and a lower cabinet. 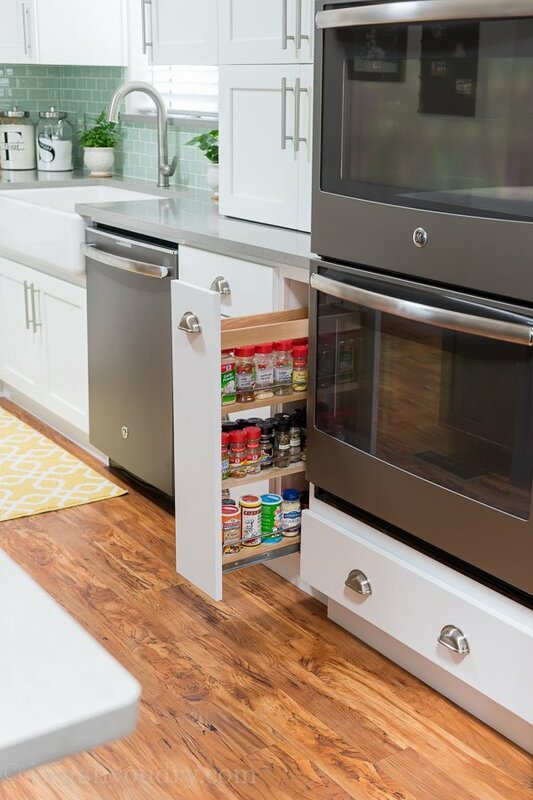 It’s directly behind the stove top, and perfect for when I need to grab my spices! Surprisingly, this little drawer holds A LOT of spices! I was shocked when I was actually able to fit all of my spices in there, and still have room for more! I can get to the spices from both sides, which is super handy. I just love how organized they all are too! I can see every single one! You guys… my stove top is one of my favorite things about my new kitchen. 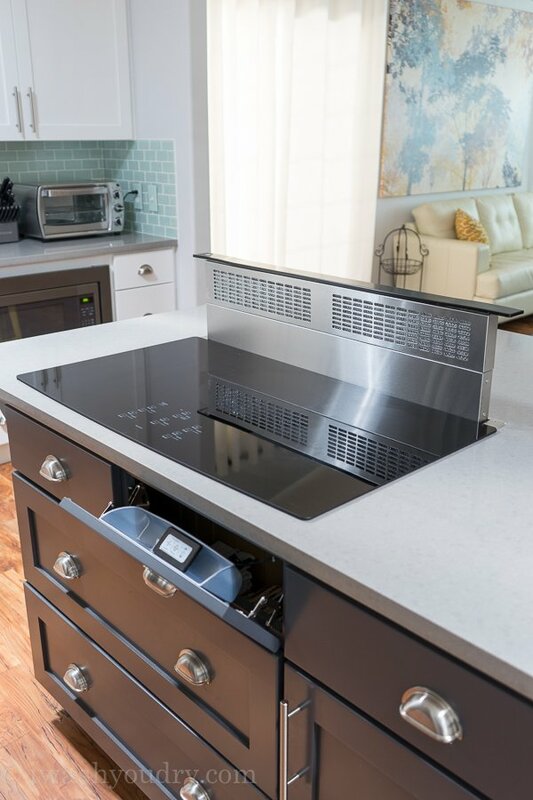 We moved the location of the stove top from a wall to the island, but I didn’t want to have a bulky hood above the island to vent the stove top. So we opted for this sleek Telescoping Downdraft System from GE. 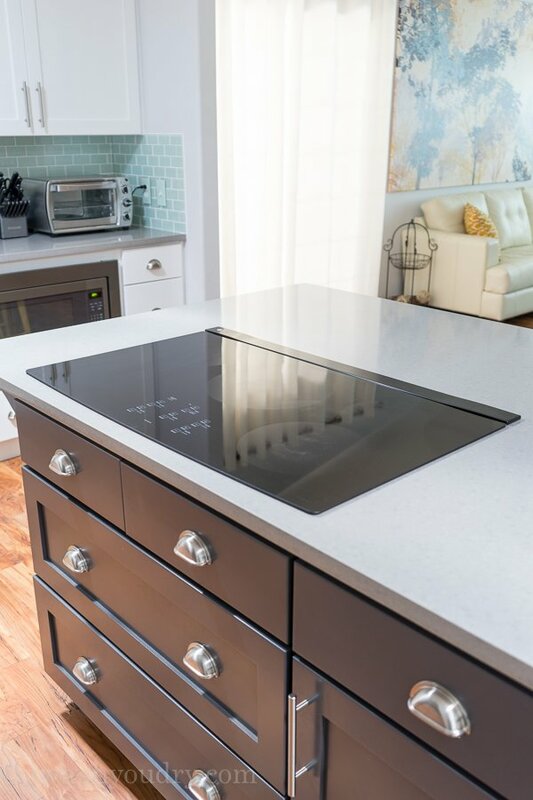 The stove top is nestled into our island and takes up the upper part of the top two drawers, which means those are not usable. Except, I needed a place to put the remote to control my vent, so I had my cabinet guy put in a swivel drawer front to hide the control, but make it easy to access. With just a quick push of a button, my vent effortlessly glides up out of my island and is ready to pump all the air outside! I love the sleek design, and I truly love how it slides right back down when I’m done using it. Clean lines! 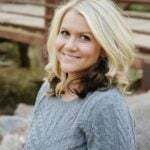 Yes, I’m talking about trash on my blog… Ok, I have seriously hated having a bulky trashcan sitting around in my kitchen, since, well, FOREVER! 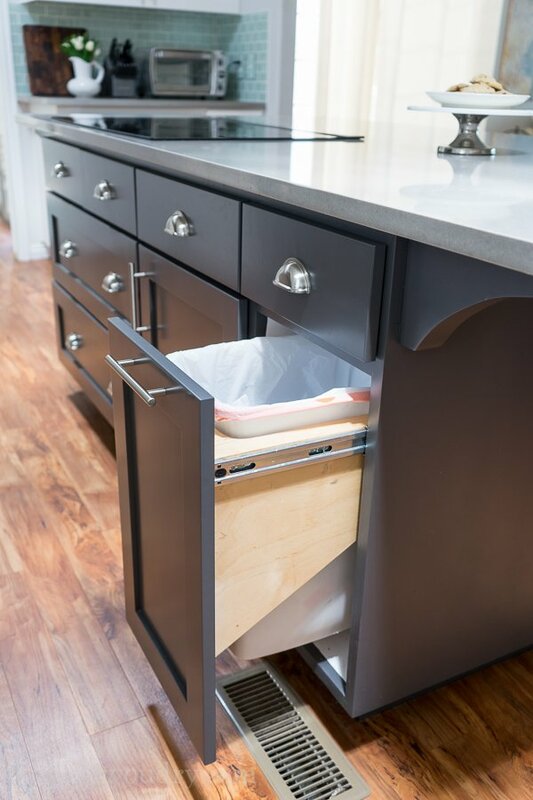 This is a super simple hack – pull out trash can! 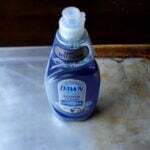 I no longer have to look at a trash can, and can keep my kitchen clean! 9. 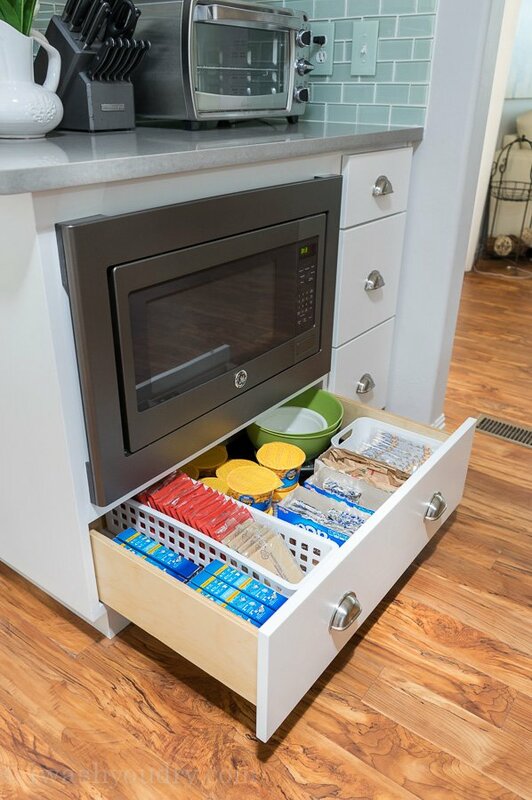 Snack Drawer for the Kids! We decided it was best to put the microwave at our kid’s level. This way I don’t have to worry about my kids trying to climb counters, or them pulling hot food out and on top of them. I thought it would be easy for the kids to have all their favorite microwave snacks right in their reach too. Things like Easy Mac, popcorn, cup of noodles and oatmeal are right there for them to help themselves. I used simple baskets to keep things organized in there. Obviously I have some vertically challenged kiddos wandering around here, so why not put things where they can reach it? 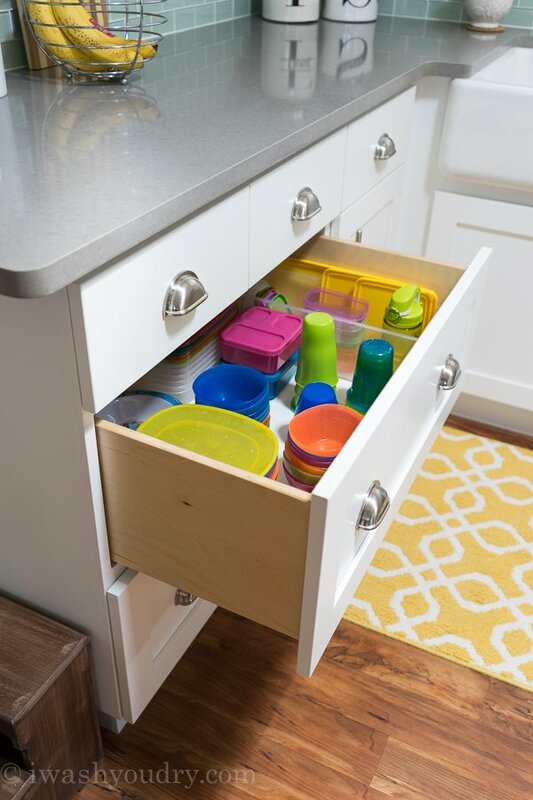 I used the large pull out drawers to organize my kid’s plates, cups, bowls, lunch boxes, water bottles, etc. 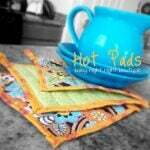 Now they can easily help set the table, get a drink of water, or pour themselves a bowl of cereal. 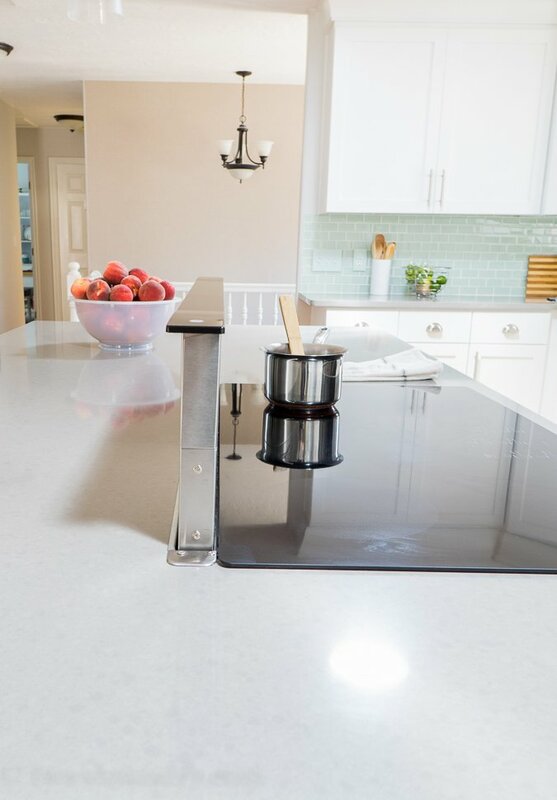 No more climbing countertops! 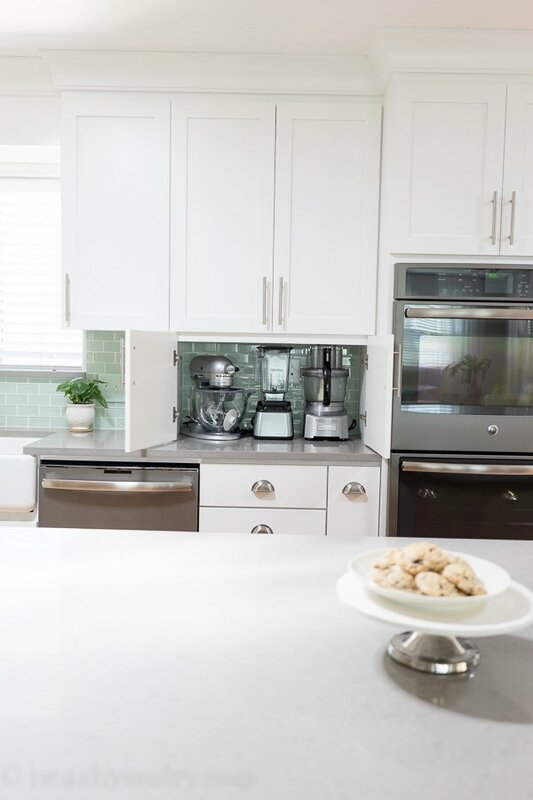 Let’s face it… I have a lot of small appliances that used to swarm my kitchen countertops, leaving them feeling cluttered and cramped. Not anymore! I kept out the ones I use most frequently and hid them in my new small appliance nook. 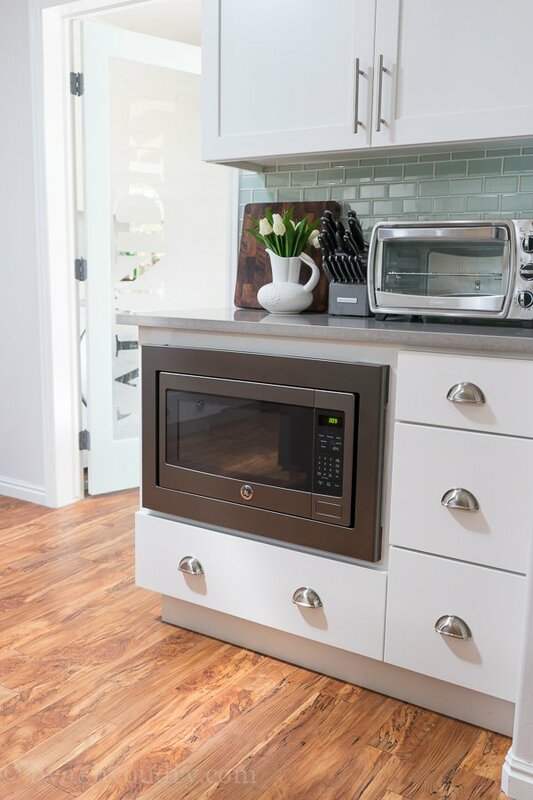 Now my appliances are easy to access, but kept hidden for a clean and clutter-free kitchen! UGH! Those pesky pot and pan lids are always a giant mess in my cabinets. But not anymore! 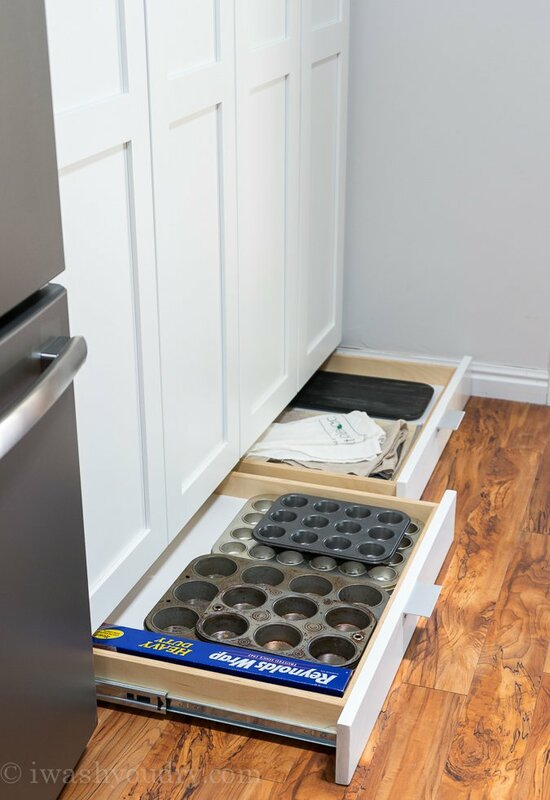 Similar to the idea of organizing the cutting boards and cookie sheets, use a metal file organizer to stack your lids upright so they stay neat and organized. 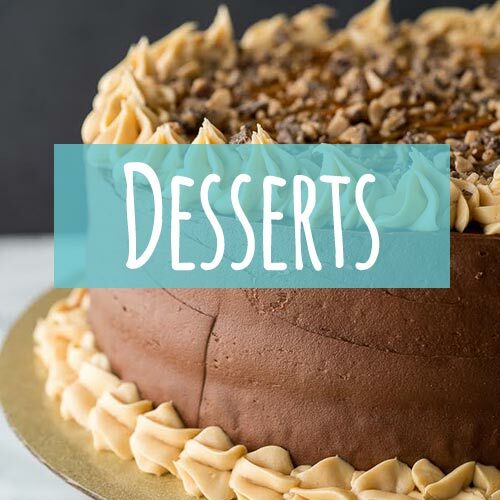 No more fumbling through the lids to find the right one! This last one makes my inner OCD extremely happy. 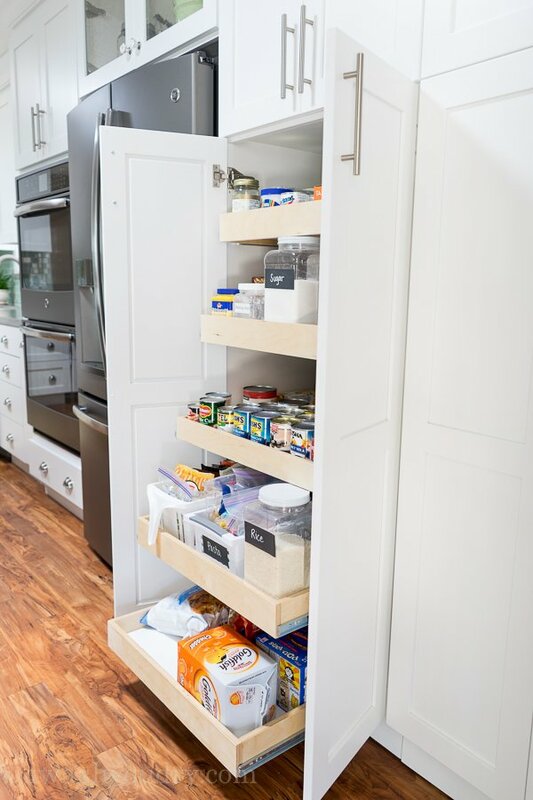 I love being able to see ALL of my pantry items at a single glance, and by spreading them out in my upper cabinet, I can do just that. I used my expandable spice rack to organize my sprinkles, and small lazy susans to organize extracts and other random spices. There are all my vinegars on the right and oils to the left. Don’t be afraid to throw some small baskets in there for other things like food scales and bagged spices. 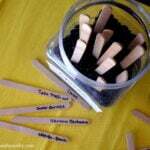 I hope you enjoyed some of these kitchen hacks and organization ideas! For more before and after photos of my kitchen, plus details like products/colors, please check out THIS POST. If you have any questions about products used in this post, just ask in the comments and I’ll be sure to answer! Thanks! Hello- What a lovely kitchen. Question regarding the telescope air vent with drawers underneath them. I am being told that due to the telescope air vent the drawers can’t be done and that I will need to put cabinets instead. Where did you place the motor and air vent pipes? Are the drawers not very deep in order to leave space for the motor? Would love to see photos is possible. Thank you! Hi Glida, you’re absolutely right that the air vent will take up space directly underneath, but with that specific model it wasn’t a ton of space. How I was able to get the drawers in there was by having my cabinet guy make shorter drawers. So instead of them being 24 inches deep, they are just 12 inches deep. We have since moved out of this house, but I used those drawers to hold pot holders, smaller pots, and baking pans. Hope this helps! Gorgeous and so well thought out! Did you do the toe kick drawers yourself, or were they part of the custom build? 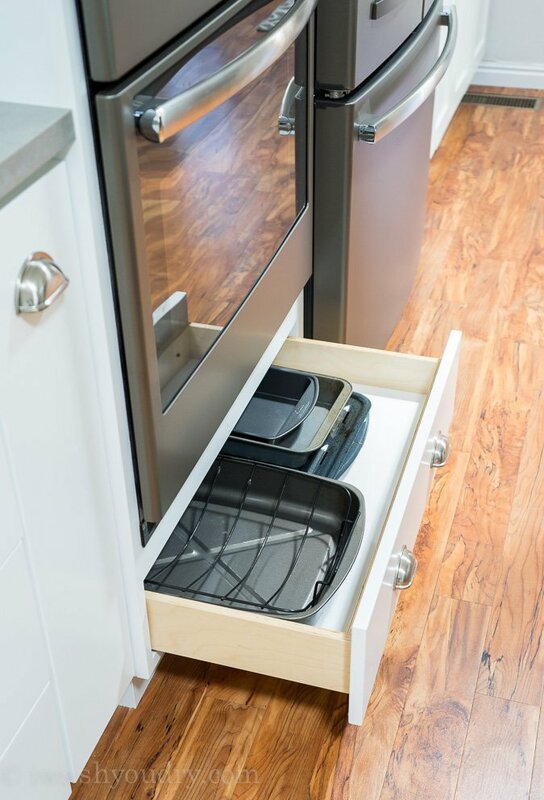 We had the toe kick drawers put in with the custom cabinets, but I’m sure that there are some tutorials out there on Pinterest! 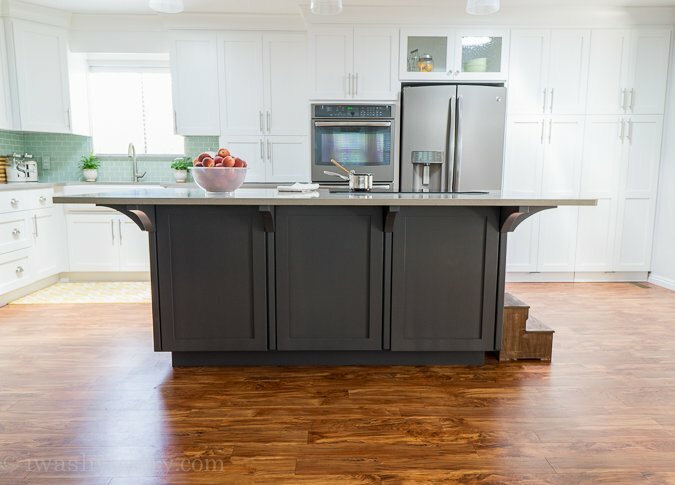 Ate these IKEA cabinets? Wondering because we’re about to renovate. Thx! No, these cabinets were custom built. 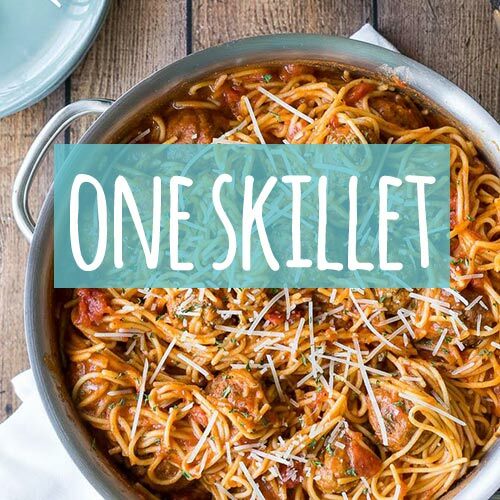 Wow – what a wonderful summary of your great kitchen ideas! 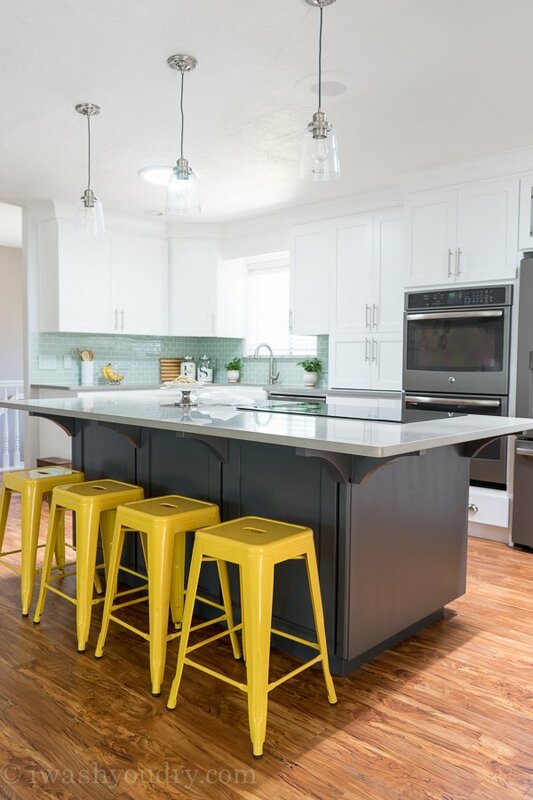 We are working on our kitchen design right now and I want to incorporate so many of them! Good luck with your new kitchen design! It’s such a fun process! Is this a unreal kitchen? Because it’s so perfect! Even the kitchen of my dream cannot be this beautiful. Thank you for sharing the advice! Pots and pans with their lids go well in a deep drawer I did this when I did my kitchen set pot with matching lid etc. Hi, I do believe this is a great website. I stumbledupon it 😉 I may revisit yet again since i have saved as a favorite it. Money and freedom is the best way to change, may you be rich and continue to help other people. Your kitchen is amazing! I love all your creative storage ideas. I wondered what brand of roll out pantry shelves you purchased. 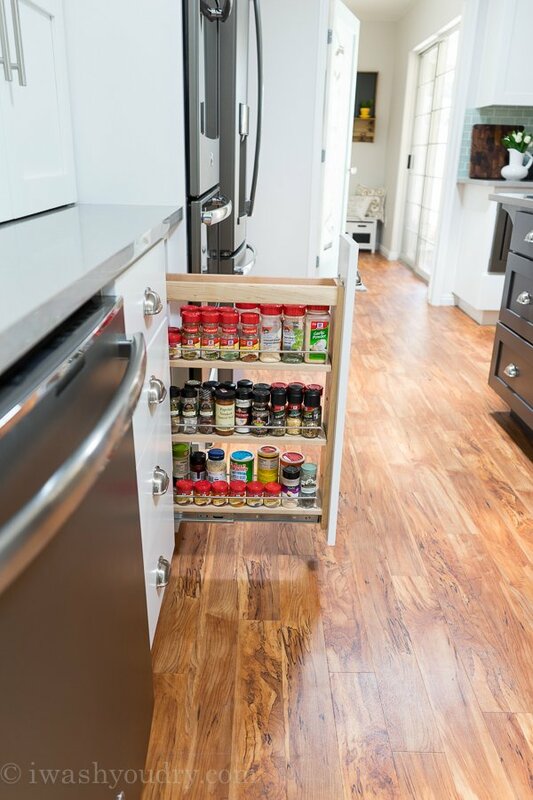 I am looking at adding these to make my pantry cupboards more functional. Thanks! I was wondering where you got the decals for your flour sugar jars? So cute! 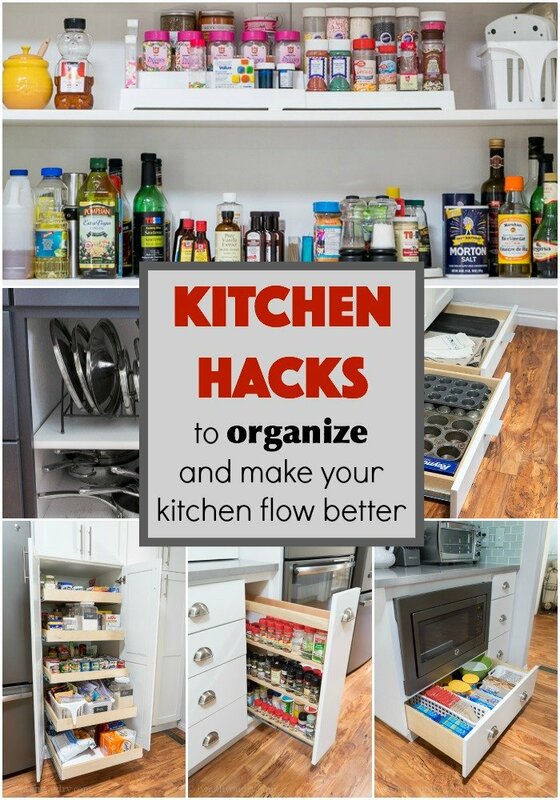 …very well organized kitchen…very very neat. Love it! Question about your stove….you mentioned the air gets pumped out. Can you tell me more on how you did this? Did you have to dig a vent/way in the ground out or were you able to tap into an existing system? I did notice you have floor vents already.